You can listen to 'Man on fire' here. Edward Sharpe and compadres are known of course because of their hit single 'Home', that still can be heard multiple times each day in the commercial of a well-known Swedish company. Most people may not even realise what the name of the song and band is. They just hum along, unconsciously. In this way the then two year old song became a belated hit single. In 2012 the band released its second album. So let's have a listen, whether the band is more than just a one-hit wonder thanks to the advertising industry. Let me start that I'm certainly not disappointed listening to Here. There is a hippyish, folk flavour over the whole album. Decades of influences seep through the sound. It even makes me think of long forgotten acts like Les Humphries Singers and Mouth & MacNeal. Very European, where Edward Sharpe is a very US collective from sunny California. A collective is a good description of this band. If you look at Wikipedia you'll find about 20 persons being associated with the band. There is no Edward Sharpe. He's a fictional person in a still to be finished novel that was started by Alex Elbert before he started the band. The moment he was joined with singer Jane Castrinos things took off and the music was given shape and definition. Here is a strange mix of folk, modern gospel, hippie, psychedelia and songs. 'Mayla' could have been a part of 'Jesus Christ Superstar' with a different text, but also holds a 'Penny Lane' like trumpet solo. The music is laidback, but also a free for all, anything is possible if it fits the song. There seem to be no rules and this is what is very attractive and to a lesser extend annoying as at times there seems to be no purpose, like at the end of the at heart beautiful 'Mayla'. 'Dear believer' is a modern day version of Fred Neal's (and Nilsson's) 'Everybody's talking' with this beautiful chorus in which the band does its wonderful harmony trick. The individual voices are mixed in this uniquely way. Edward Sharpe at its basis is a man with guitar, usually assisted by one woman. Then they have all these beautifully decorated building blocks scattered around the studio. From there the accompaniment of a song is constructed, but always relaxed. Never the need to hurry. 'Child' shows that the band can desist temptation and let lay the toys in their corners. At these moments the strength of the composition shines through. Where 'I don't wanna pray' and 'From one love to another' are fun, but a little to pastiche like, songs like 'Child' show the true strength of Edward Sharpe. Let me end this review with mentioning 'Fiya wata'. In this hippie song Jane Castrinos comes forward the strongest. She adds another song that has not been made since the 60s. Totally out there, folky, bluesy with a Jefferson Airplane sauce over it, that is very appealing. Here surprised me. 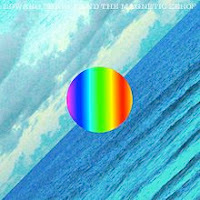 Edward Sharpe and the Magnectic Zeros is much more than just one hyped song. Although they may never score another hit single again, it does deserve to be heard, here, now and later.